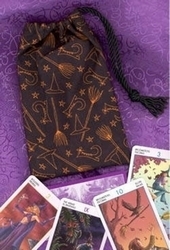 Short Bags - Hocus Pocus Short Bag - Tarot Bags, Tarot Cards, Cloths, & More! 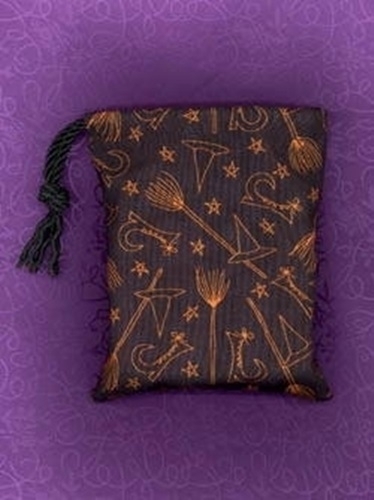 What a bewitching fabric and it makes the ideal Wiccan gift bag too! This short tarot bag or runes pouch is made of a black fabric that has orange broomsticks, pointed witch hats, pentacles/stars, and curved-toe lace-up boots. Size: Short/Runes Pouch, approx. 5 x 6 inches. Cord is black. Details: It's the perfect size for Witchy Tarot Mini deck or the Gypsy Witch Fortune Telling Playing Cards or other small decks of a similar size. Store your gemstones or short crystal wands inside. Use it for a spell kit. This is the ideal gift for a Wiccan friend, just stuff it will items your friend would want. Let your imagination soar!